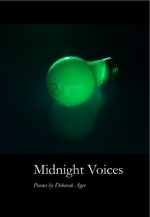 Midnight Voices by Deborah Ager is a book of poems grappling with identity on many fronts. As the cross-dressing revolutionary war soldier Deborah Sampson says, in the opening poem by the same name, "I do not remember / the men I've killed. I do not remember / which of my names is my true name." It is also a collection that grapples with place--naming the Atlantic, Florida, Spain, Iowa, San Francisco, and Santa Fe in its titles, and taking us through hospitals, museums, lakes, and parks as these poems seek, line-by-line, to understand what they so keenly observe--both outwardly as scenes and events, and inwardly, as a panoply of sensitive, intelligent speakers seek their way as strangers in their own lands. The "X" (as in "'X' marks the spot") recurs in several poems, as indeed each speaker seems to be longing for the certainty and guidance of a map. But the poems themselves are the treasure--of spare, delicious ambiguity. Few comforts issue from these midnight voices. Few pleasures emerge any less fleeting or terrible than the man in the holocaust museum embracing an unknown woman, as he explains to her, "What's strange: how long you stay / with me before you turn and say / you must have the wrong girl." There's nothing mistaken about Ager's poems--elegant and haunting, with a cultivated coolness reminiscent of W.S. Merwin's The Lice, these voices have learned to speak, like Ager's "good wife" studying her 1950s guidebook, with a terribly "soothing voice." Categories: Books and Poetry. Tags: First Books. Poets: Deborah Ager.